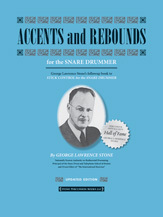 George Lawrence Stone’s Accents and Rebounds, the follow-up to the classic Stick Control, builds on the basics with accent routines and more advanced rhythms to improve the player’s finesse and control. This book includes sections on accented eighths, dotted notes, and triplets, as well as rebound control and more. If you are a fan of Stick Control, then this method supplies the perfect next step for your practice routine. This updated edition adds Joe Morello’s legendary arrow notation to help students incorporate the motions of the Moeller technique.